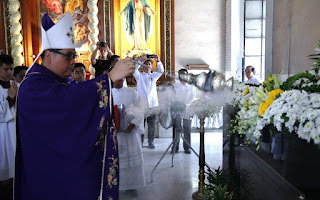 PASIG CITY – Pasig Bishop Mylo Hubert Vergara headed the celebration of the Holy Eucharist celebrating the first death anniversary of the late first Pasig Bishop Francisco C. San Diego, D.D. in the Immaculate Conception Cathedral last August 26, 2016. He described Bishop Francisco as a Steward, Servant, and Shepherd. “As a Steward, he nourished the gift of vocation to serve God in the priesthood and episcopacy. We must make sure to take care of what we simply borrowed,” reminded the Bishop. On being a servant, Bishop Francisco’s motto is “Servus Dei”. “He served the Church till his last breath. Even in his last breath, he gave his life to the flock. We are called in many ways: as teachers, as parents, and others. How have I been a servant, giving all to the Lord?” challenged the Bishop.